Hey there any mod wanna reply? 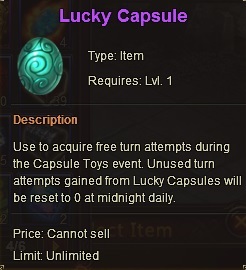 This item si called Lucky Capsule, to use it for free spin at Toy event you have to search for it at your inventory it won´t appear at your toy event right away as you can save this item and use it in next toy event. If you wish to use it in this toy event then after finsind it at your inventory click on use and free spin at toy even will appear. Have a good day. I´ll make report for you. Thank you for the reply. Please inform them to hurry a little bit. Hoping for a positive response. 2019-4-23 06:48 GMT+8 , Processed in 0.066546 second(s), 52 queries .